Washington DC has many fine restaurants with an elegant atmosphere and beautiful scenery. Some overlook parks and some have water views, including a fine dining restaurant on an excursion boat. Here are some of the best places to dine with panoramic views. Lafayette - Hay Adams Hotel, 16th and H Streets NW, Washington, D.C. (202) 638-2570. The upscale restaurant offers fine dining with a menu of contemporary American cuisine and a view looking out over Lafayette Park and the White House. Open for breakfast, lunch, and dinner. New Heights - 2317 Calvert Street NW, Washington, D.C. (202) 234-4110. Enjoy New American cuisine overlooking Washington, DC’s beautiful Rock Creek Park. The restaurant has been a neighborhood favorite for nearly three decades. During the warmer months of the year, dine at the Patio-on-Calvert. Sequoia - 3000 K Street NW, Washington, D.C. (202) 944-4200. Enjoy beautiful views of the Potomac River from this Georgetown restaurant. During the summer months, dine outdoors on the waterfront patio, and during the winter enjoy the view from the floor to ceiling windows. The menu includes modern American classics and a variety of seafood dishes. Tony & Joes Seafood Place - 3050 K Street NW, Washington, D.C. (202) 944-4545. This seafood restaurant on the Georgetown waterfront offers one of the best views in D.C. from its popular patio. The floor to ceiling windows provide inspiring views year-round. Roof Terrace Restaurant - John F. Kennedy Center for the Performing Arts, 2700 F Street, NW, Washington, D.C. (202) 416-8555. 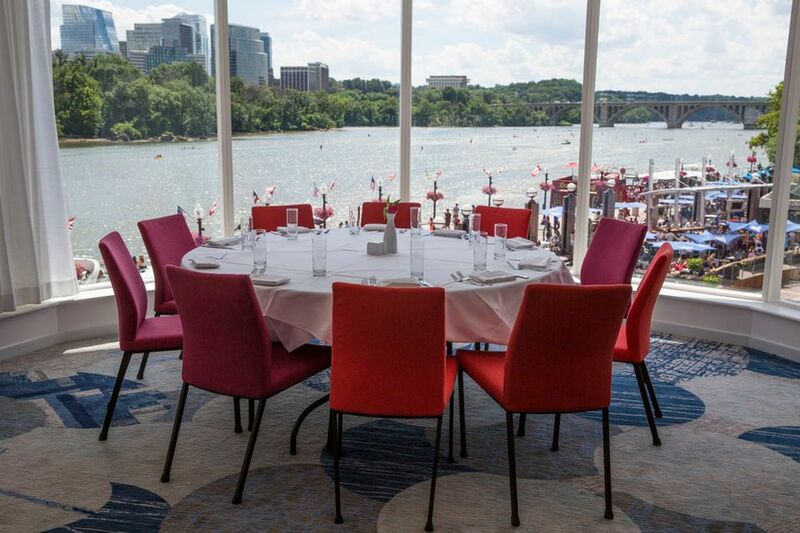 The restaurant, located at the Kennedy Center, offers intimate dining, pre-theatre menus, Sunday brunch buffets, and holiday specials with expansive views of Georgetown and Washington, D.C.
Odyssey Cruises - Gangplank Marina, 600 Water Street, SW, Washington, D.C. (202) 488-6030. Enjoy a 3-hour sightseeing tour of the Potomac River with a 4-course meal, topped off by music and dancing. See views of Washington, D.C.'s memorials, the Kennedy Center, Georgetown, and Old Town Alexandria. Dinner, lunch and brunch excursions are available year-round. Specialty cruises are offered including Valentines Day, Cherry Blossom, Easter, Full Moon, Fireworks Cruises, and more. Old Hickory Steakhouse - Gaylord National Resort, National Harbor, MD. (301) 965-4000. The stunning contemporary restaurant offers an upscale menu, an intimate ambiance, and sweeping views of the Potomac River. Skydome Restaurant & Lounge - Doubletree by Hilton, Crystal City. 300 Army Navy Drive, Arlington, VA. (703) 416-4100. The revolving rooftop restaurant and lounge offers a great 360-degree view of Washington, DC. A full dining menu is available featuring a wide variety of dishes including burgers, fish, turkey pot pie, grilled ribeye steak, and more. Opaline Bar and Brasserie - Sofitel Hotel, 806 15th Street, NW Washington, D.C. (202) 730-8701 The modern Parisian-inspired restaurant at the upscale hotel overlooks Lafayette Park and the White House. Farmers Fishers Bakers - 3000 K Street NW, Washington, D.C. (202) 298-TRUE (8783). The environmentally friendly restaurant, located on the Georgetown waterfront, features an in-house bakery, sushi counter, full bar with 24 beer taps, and year-round patio with views of the Potomac River.